The last stand in The Last Stand is well-staged and entertaining, but it takes a long time to get there and the stakes of the showdown are non-existent. The ride is sustained with a tongue firmly planted in cheek, playing up the ridiculous elements of the story while gleefully dismissing all logic. It’s fun in bursts, but not sustainable. 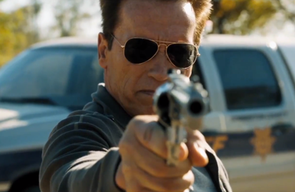 While not the showiest vehicle for Arnold Schwarzenegger’s return to action headliner, his role of a former big city cop turned aged small-town Sherriff thrust back into bloody battle after semi-retirement fits the film’s sprightly shtick. Ultimately though, there’s too much time devoted to unnecessary plot maneuverings to have too much fun with it all. Ruthless cartel kingpin Gabriel Cortez (Eduardo Noriega) escapes during a prison transfer in Las Vegas and it’s up to F.B.I. Agent John Bannister (Forest Whitaker) to bring the fugitive back into custody. Making this task difficult is the stolen souped-up Corvette provide to Cortez to aid his escape to Mexico. Speeding toward the border at 200 miles per hour with an F.B.I. Agent hostage (Genesis Rodriguez), Cortez plans to cross on the outskirts of sleepy desert town Sommerton Junction where his associate Burell (Peter Stormare) and a small militia are building a bridge across a narrow ravine. What they misjudge is the resistance provided by steadfast Sheriff Ray Owens (Schwarzenegger) and his deputies, who take on Stormare and his goons and lay in wait for Cortez, aided with the arsenal of local weaponry enthusiast Dinkum (Johnny Knoxville). With his English-language debut, Korean director Kim Ji-woon is able to showcase his unique blend of hyper violence and coarse comedy that marks his previous work (The Good, the Bad, and the Weird, I Saw the Devil), but the translation of his sensibilities is somewhat lost. We know where these shenanigans are headed and are forced to sit through a lot of rigmarole that only delays the inevitable. Instead of using the inertia of the speeding car, the race to build the bridge before it gets there, and the frantic prep of Sherriff Owens, we get explanations of why the F.B.I can’t give chase and the growing angst of Bannister. Prior to the finale, the car only factors into a brief scene evading/pummeling a pair of SWAT team SUVs. It’s mostly bad guy snarls and irritated stares from Rodriguez, whose character is wholly unnecessary, save for a goofy twist and an explanation for why they can’t just blow up the car… or something, anything else to slow it down. Back in Sommerton, there’s a lot of contemplation over the complicated flirtations of two deputies (Jaimie Alexander and Rodrigo Santoro) – one of which wasn’t actually a deputy when the film began, but a war veteran turned drunk who could be of service in this situation. This is the level of convolution that gums up the works and sways the film into the realm of tedium. Another deputy’s fate is a downer that does nothing to inform the plot or the mindset of the characters. In the end it doesn’t even matter that this person ever existed. The Last Stand exists for the final showdown and this is where the film shows some technical merit and has some fun. The action is immediate and fluid, Kim Ji-woon orchestrating some interesting carnage. There’s a lot of blood (a lot of it CGI), a lot of human and vehicular carnage – at one point body parts litter Main Street, and some fun stunt work. All of that is somewhat fleeting, however. When Cortez’s car zooms past the havoc, the film goes on autopilot again, racing more to wrap up the story than captivate with its car chase and climactic battle between Schwarzenegger’s everyman and the evil cartel scourge. The former governor still has a presence though he struggles a bit to find his groove, his one-liners interrupted by awkward pauses as if he’s waiting for applause. While there are some things to cheer here, The Last Stand focuses too much on the artifice and not enough on the action.